I need an opinion from a dentist who doesn’t have a dog in the fight. I want to get porcelain veneers. My dentist wants me to get Lumineers. He says with any other brand he’d have to grind my teeth down. I don’t want that. But, I’ve heard Lumineers don’t look that great. He said he’s certified so they’ll look great. I just want to see what another dentist thinks before I do something permanent. I’m glad you wrote to check first. It sounds like you’ve gone to your family dentist for a cosmetic procedure. While cosmetic dentistry isn’t a recognized specialty and any general dentist is technically allowed to do cosmetic work, it does take some actual training and artistry to do it well. There are a few things your dentist said that leads me to believe he does not have the expertise necessary. First, let’s talk about his “certification”. With Lumineers, dentists sit through a short seminar, then they’re certified. That’s it. It doesn’t help them develop any skill. It doesn’t check their artistry and understanding of the intricacies of the differences of color on the different areas of the tooth. It just tells them Lumineers are simple to place and they’re good to go. Another thing he said that concerns me is the “grinding down”. 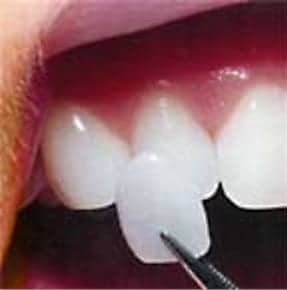 First, teeth never need to be ground down for any type of porcelain veneers, no matter what the brand. Dental crowns require grinding of the teeth. Porcelain veneers only require a mild tooth preparation. If any shaving is done, it’s so mild you won’t even be able to tell much of a difference between the shaved and unshaved teeth. 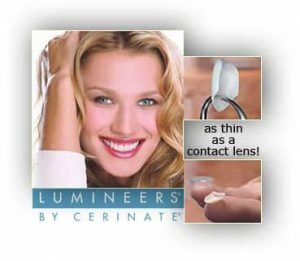 Lumineers are heavily marketed to inexperienced dentists as being easy to place because no tooth preparation is necessary. But, truthfully, many cases need that prep, even with Lumineers. Otherwise, their smile looks bulky. Some people have described it as horse teeth. Who Should Do Your Smile Makeover? About now you’re probably worried you’ll never get that smile you’re hoping for. You will. I just don’t believe you’ll get it from this dentist. He may be an absolutely brilliant general dentist, just not great for cosmetic procedures. I’m recommending you look for a dentist in your area who’s been recommended by the mynewsmile.com website. Dentists cannot pay to get recommended on the site. Instead, they have to demonstrate both their technical skill and artistry. If a dentist is recommended by them, you’ll get a gorgeous smile. It doesn’t mean you’ll have to leave your current dentist. You’ll just have two—one for general care and one for cosmetic work.